Alex A. 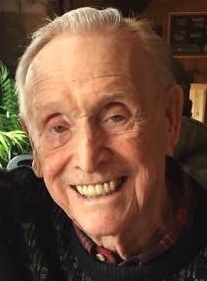 “Jim” Griffin age 94 of Perry Lake Township died on March 25, 2019 at the Sunrise of Minnetonka. He was born in St. Cloud on June 15, 1924 to Andrew and Marie (Rausch) Griffin. Jim is survived by three daughters, Maureen Griffin of Minnetonka, Gwen (Ken) Schoen of Duluth, Jill (Dennis) Griffin-Skovsted of St. Paul; seven grandchildren, Bryant, Zach, Alexandra, Patrick, Aily, Ian and Katie Rose; seven great grandchildren, Nola, Carolyn, Jackson, Ava, Opal, Fern, and Quinn. Preceding Jim in death are his parents; wife, Jeanne Griffin; life partner, Sharon Peterson; one brother, Dan Rochon, one sister, Camilla Rose and a grandson, Evan Wilson. Mass of Christian Burial will be 11:00 a.m. Thursday, April 4, 2019 at St. Joseph’s Catholic Church in Crosby. Burial will be at the Lakewood Cemetery in Crosby. Visitation will be one hour prior to the service at the church. Arrangements are with the Koop Funeral Home in Crosby.